Linda Kohanov is beloved for her groundbreaking articulation of the way of the horse,” an experiential wisdom known to riders for centuries but little studied or adapted to off-horse use. Now Kohanov takes those horse-inspired insights on exceptional communication and leadership into the realms of our workplaces and relationships. Here we explore the benefits of nonpredatory power” in developing assertiveness, fostering creativity, dealing with conflict, and heightening mind-body awareness. In the first part of this far-reaching book, Kohanov profiles cultural innovators who employed extraordinary nonverbal leadership skills to change history, usually on horseback: Winston Churchill, George Washington, Alexander the Great, and the Buddha, among others. She also draws on the behavior of mature horse herds, as well as the herding cultures of Africa and Mongolia, to debunk theories of dominance hierarchies, challenge ingrained notions of survival of the fittest,” and demonstrate the power of a consensual leadership in which governing roles are fluid. Kohanov adapts these lessons into twelve powerful guiding principles we can all incorporate into our work and personal lives. 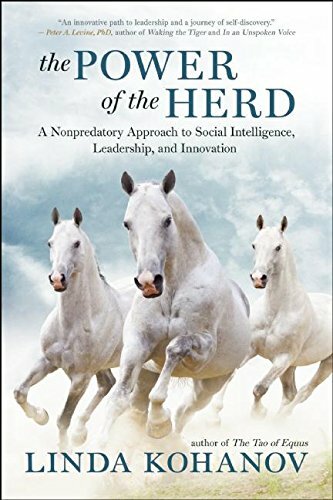 Eloquent and provocative, this is horse sense for everyone who seeks to thrive in the herds we all run in our communities, careers, families, and friendships. The author of the bestseller The Tao of Equus, Linda Kohanov speaks and teaches internationally. She established Eponaquest Worldwide to explore the healing potential of working with horses and to offer programs on everything from emotional and social intelligence, leadership, stress reduction, and parenting to consensus building and mindfulness. She lives near Tucson, Arizona.